Sapele is the wood widely used as veneers for furnitures,wall paneling, wood door, or engineered wood flooring as well as other interior decoration. Sapele engineered wood fooring with blood reddish color is very similar to Santos Mahogany, while the little difference is the wood grain of sapele is more straight ,something like Iroko. 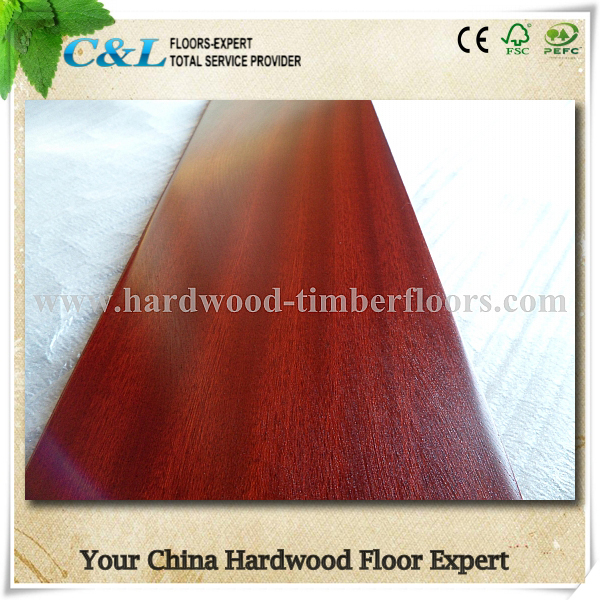 C&L hardwood in China supply both solid 18mm T&G sapele flooring & Engineered 12mm ,15mm sapele wood flooring with 0.6-3.0mm toplayer. 12mm engineered sapele wood flooring with 1.5mm thickness has been used on big hotel projects in bulk quantity at very competitive pricing(1.65USD/S.Q.F).